I have to load a CSV file having an id (cui), and a name of a disease, some of the ids are repeating themselves but they have a slightly different name. I would like to create the nodes with unique id and nodes for all the other names which are slightly different. the nodes with alternative name will have a relationship [:HAS_ALTERNATIVE_NAME] with the initial nodes. I have a query which is appending the alternative names in the node property, this time I will like to normalize the problem by creating a node for each alternative name. 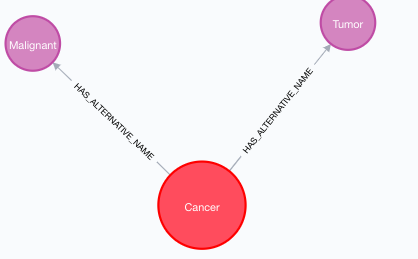 In the end, I will like to have something like this situation, one disease having alternative names nodes. How do I load nodes and edges from different files in neo4j using cypher efficiently? How to create unique nodes and relationships by csv file imported in neo4j?